WHEN US Secretary of State John Kerry spoke the other day about how weapons like mustard gas had been used in the First World War, and how nations had agreed afterwards to ban them, he was being a little economical with the truth. In fact, both the United States and its rivals kept on producing and stockpiling sarin, the chemical successor to mustard gas, throughout the Cold War years, and it was not until 1993 that a UN convention was passed outlawing it. And though Kerry referred to Adolf Hitler, Saddam Hussein and Syria's president Assad as the only three rulers to have used such gas against their own citizens (Mussolini used gas against Ethiopians), there is one country at least where World War I gas munitions were used against the people just a few years after the war ended. The Battle of Blair Mountain took place in a period of intense class struggle in the coalfields of southern West Virginia. Beginning in 1870–1880, the mining companies had established company towns where the bosses' will was law. They hired private detectives to supplement the work of public law enforcement bodies keeping out the unions. They used harassment and violence and they did not stop at murder. Still the miners organised. There were a series of strikes. Employers routinely expelled striking miners and their families from the company homes. During the Paint Creek Cabin strike of 1912-13 the Governor declared martial law. Militants were hauled before military courts. The famous working class agitator Mother Jones was arrested for "inciting a riot" - she said she had merely been reading from the American Declaration of Independence. The employers used 300 agents of the Baldwin-Felts detective agency as professional strikebreakers. The agents drove an armoured train through a tent colony of miners' families, opening fire with a machine gun, and killing perhaps 50 people. Similar methods led to the Ludlow Massacre in Colorado the following year. Early in 1920 the United Mine Workers of America (UMWA), led by John L.Lewis, having organised much of West Virginia, turned to the southern coalfields, which remained largely non-union areas. Mingo County seemed a good place to start. Unlike neighbouring Logan County where Sheriff Don Chafin and his deputies were fiercely anti-union, Mingo had some more independent, even sympathetic, elected officials. Cabell Testerman, the mayor of Matawan, was one, and he appointed 27-year old Sid Hatfield, a former miner, as town sheriff. As the union set about organising in Mingo County, the mine owners responded by firing and blacklisting trade unionists, and evicting them from their homes. The UMW set up tent colonies for homeless miners' families. 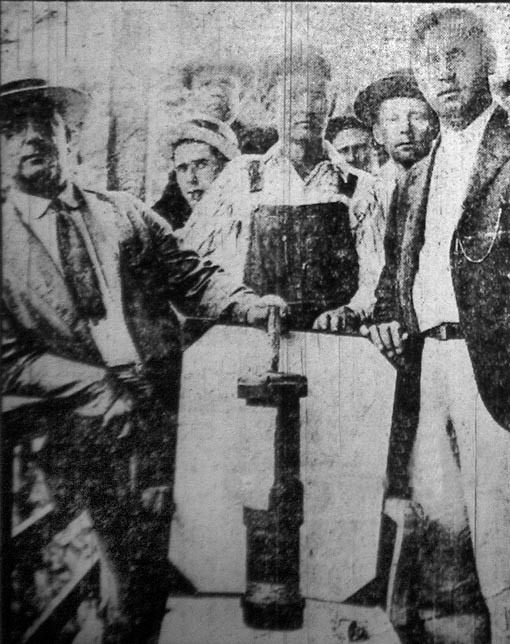 By early May some ,000 out of 4,000 Mingo County miners had joined the union. At the Stone Mountain Coal Company mine near Matewan, every single worker unionized, and was subsequently fired and evicted. On May 19, 1920, 12 Baldwin-Felts agents arrived in Matewan. Among them were directors Albert and Lee Felts. Albert Felts had already tried to bribe Mayor Testerman with 500 dollars to place machine guns on roofs in the town, which Testerman refused. That afternoon, Albert and Lee along with eleven other men set out to the Stone Mountain Coal Company property. The first family they evicted was a woman and her children, whose husband was not home at the time. They forced them out at gunpoint, and threw their belongings in the road under a light but steady rain. The miners who saw it were furious, and sent word to town. As the agents walked to the train station to leave town, Sheriff Sid Hatfield and a group of deputized miners confronted them and told the agents they were under arrest. Albert Felts replied that in fact, he had a warrant for Sid’s arrest. Testerman was alerted, and he ran out into the street after a miner shouted that Sid had been arrested. Hatfield backed into the store, and Testerman asked to see the warrant. After reviewing it, the mayor exclaimed, “This is a bogus warrant.” With these words, a gunfight erupted and Sid Hatfield shot Albert Felts. Mayor Testerman fell to the ground in the first volley, mortally wounded. In the end, 10 men were killed, including Albert and Lee Felts. Sid Hatfield became a hero to the union miners, who took heart that the bosses and their hired guns could be beaten. The union continued to grow, but so did the mine owners' determination to break it. The tension was expressed in incidents along the Tug River, where many miners and their families were camped. In late June state police raided a tent colony at Lick Creek, claiming they had been fired on. They shot and arrested miners, tore down tents, ripping them to shreds, and scattered people's belongings. On January 26, 1921, the trial of Sid Hatfield for killing Albert Felts began. This trial was in the national spotlight, and it brought much attention to the miners’ cause. Hatfield’s stature and mythical status grew as the trial proceeded. Sid Hatfield posed and talked to reporters, fanning the flames of his own stature and legend. All men were acquitted in the end, but overall the union was facing significant setbacks. Eighty percent of mines had reopened with the importation of non-union labour, and the signing of " yellow dog" contracts by ex-strikers returning to mines. In mid-May 1921, a three day battle between union miners and scabs spread along the Tug River valley and was only ended by the imposition of martial law. Hundreds of miners were arrested and imprisoned. The miners took up a guerrilla war. On August 1 1921 Syd Hatfield traveled to McDowell County to stand trial for charges of dynamiting a coal tipple (device used to tip coal into goods wagons). Along with him traveled a good friend, Ed Chambers, and their two wives. As they walked up the courthouse stairs, unarmed and flanked by their wives, a group of Baldwin-Felts agents standing at the top of the stairs opened fire. Hatfield was killed instantly, while Chambers' bullet-riddled body rolled to the bottom of the stairs. Over Sally Chambers' protestation, one of the agents ran down the stairs and shot Chambers once more in the back of the head point blank. As Sid and Ed’s bodies were returned to Matewan, word of the slayings spread through the mountains. The miners believed that Hatfield was slain in cold blood, and it soon appeared the assassins would escape punishment. Enraged miners took up arms. Along the Little Coal River patrolling armed miners stopped a squad of Logan County troopers sent by Sheriff Don Chafin, disarmed them, and sent them running. On August 7, 1921, the UMW held a rally at Charleston, and presented a petition to the Governor. When he rejected this, the miners began talking of a march to Mingo County, to free the prisoners and end martial law. This would mean going over Blair Mountain and through Logan County, where they were bound to encounter better-armed force. Despite urgings of caution, they were determined to go ahead. Up to 13,000 men began marching towards Logan County. In Kanawha County miners commandeered a freight train and headed to join them. Meanwhile on Blair Mountain, Sheriff Chafin, financially backed by the Logan County coal owners, set up defences, with an armed force of 2,000 men. As the first skirmishes broke out, President Warren Harding threatened to send in federal troops and US army Martin MB-1 bombers. After a long meeting in the town of Madison, agreements were signed to persuade the miners to return home. But this was just the beginning. Within hours of the meeting there came reports that Sheriff Chafin's men were shooting union supporters in the town of Sharples, north of Blair mountain, and that women and children had been hit. The miners turned back, many traveling in commandeered trains. Chafin's private army, though outnumbered, had the advantage of holding higher ground, and being better armed. Planes were used to drop both explosive and gas bombs, munitions left over from the First World War, on miners near the towns of Jeffrey, Sharples and Blair. On orders from General Billy Mitchell, army bombers from Maryland provided aerial surveillance. Some of the miners had served in the army, and had the helmets and gas masks which they had kept for this occasion. Some of the gas may not have come far -it was manufactured in Kanawha County. Battles continued for a week, with the miners at one time nearly breaking through to the town of Logan and to the Logan and Mingo counties. Up to 30 deaths were reported by Chafin’s side while the miners lost between 50 and 100, with hundreds more wounded. By September 2, Federal troops had arrived, and miners' leader Bill Blizzard felt he had no option but to advise the men to return home. Following the battle, 985 miners were indicted for murder, conspiracy to commit murder, accessory to murder, and treason against the State of West Virginia. Though some were acquitted by sympathetic juries, many were also imprisoned for a number of years, though they were paroled in 1925. At Bill Blizzard's trial the defence exibited an unexploded bomb they had captured as evidence of the government and companies' brutality. This helped in his acquittal. In the short term, the battle was an overwhelming victory for the coal owners. Union membership slumped to a mere fraction of what had been gained, and it was not until the New Deal years of the late 1930s that the UMW recovered, and was able to organise southern West Virginia. But the battle had also raised much wider awareness of the miners' struggle, and much greater class consciousness which crossed boundaries, leading to the UMW's alliance with the Steelworkers, and the rise of the AFL-CIO unions as a whole. It also obviously raised the need for a political voice, though why US labour did not take that further is a good question.